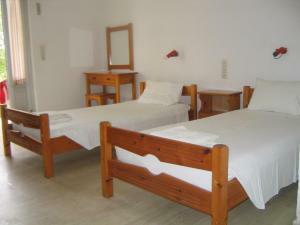 Just footsteps away from the beach, you will find these studios in a quiet area but near all activities and comforts you may need for an enjoyable holiday. Magdas Studios are located in a fantastic geographical position for enjoying the sunsets of Corfu. As the sky fills with warm, sultry colours, enjoy a long cool drink with friends from the terrace of a cafe or restaurant. Stroll along the beach and hear the waves crashing as the stars creep out in the tranquil night sky. Then, when the sun is ready to show its shining face again, enjoy another sun-drenched day. Head to Aghios Georgios beach where you can take part in water sports such as surfing. Round off a fun-filled day with a visit to a nearby restaurant or bar. Είστε ιδιοκτήτης ή διευθυντής στο MAGDAS STUDIOS; Εγγραφείτε τώρα για δωρεάν εργαλεία, που μπορείτε να χρησιμοποιήσετε για να βελτιώσετε την καταχώρησή σας και να συνδέσετε την ιστοσελίδα σας και το σύστημα κρατήσεών σας.